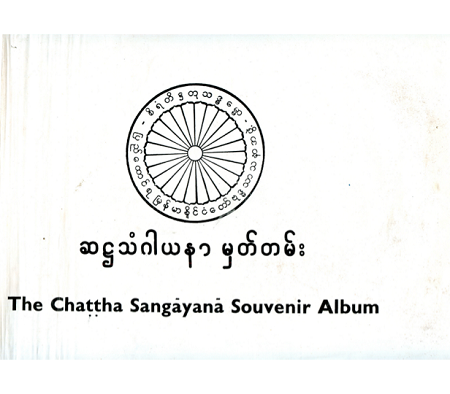 This souvenir album contains photos and text documenting the Sixth Buddhist Council. The Sixth Buddhist Council was inaugurated at Kaba Aye in Yangon (formerly Rangoon, Burma) in 1954, 83 years after the Fifth Council in Mandalay. It was sponsored by the Burmese Government led by the Prime Minister, the Honorable U Nu. He had previously authorized the construction of the Mahā Pāsāna Gūhā, a great artificial cave built from the ground up and completed in 1952, to serve as the gathering place, much like Rajgiri's Sattapānni Cave in India had housed the First Council immediately after the death of the Buddha. This new "cave" measured 220' by 140' inside and could seat 10,000 people. The Sixth Council opened on May 17, 1954. Like the preceding councils, its chief objective was to recite, affirm and preserve the genuine wording of the Vinaya, Suttas and Abhidhamma--the pariyatti--as related by the Buddha and his principal disciples. This Council was unique in that the 2,500 learned Theravāda monks who participated came from eight countries--Myanmar, Thailand, Cambodia, Laos, Vietnam, Sri Lanka, India and Nepal--unlike previous councils which had included monks from the host countries only. Mahayana monks and representatives from all Buddhist countries also attended. The complete traditional recitation of the Theravāda Canon took two years, from 1954 to 1956. The Pali Tipiṭaka and its allied literature in all the diverse national scripts were painstakingly examined, their differences noted, necessary corrections made, and all the versions collated. Happily, it was found that there were only minor differences in the content of comparable texts in the various scripts. After the Council had officially approved them, the volumes of the Canon and its Commentaries were prepared for printing on modern presses and published in the Myanmar (Burmese) script. By the time the Council was over, all the participating countries had had the Tipiṭaka rendered into their native scripts, with the exception of India. The Council closed on the full moon of May 1956, exactly two and a half millennia after the Buddha attained parinibbāna. The version of the Tipiṭaka which the Sixth Buddhist Council produced is recognized as being true to the pristine teachings of Gotama the Buddha and the most authoritative rendering of them to date.